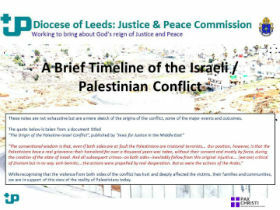 During the last 40 years the Leeds Diocesan Justice and Peace Commission has been mindful of the oppression and injustices suffered by people from different parts of the world at different times. We have sought to hear their stories and publicize them and, where possible, to examine and challenge the perpetrators and support the victims. The situation of the Palestinian people has been one such focus for many years. Over the 40 years war, armed conflicts and terrorist attacks have taken their toll on both Israelis and Palestinians. The persecution of the Jews has been a constant in their history; the Holocaust being one of the most recent and heinous crimes against them. The dream of a safe homeland is understandably strong but tragically when considering the plight of the Palestinians their dream is not recognised as legitimate. Israel has the right to defend itself but issues around questions of proportionality in terms of response of attacks by Hamas, the flouting of International Law and the Geneva Convention are raised by the treatment meted out to the Palestinians. There is a huge imbalance in the power structures: the USA provides Israel with $3b. per annum for its arms industry and defence and vetos UN Resolutions year upon year. Use the timeline we developed for a conference in 2015 to help unravel some of the history that helps to explain how there is such an intractable situation there now. 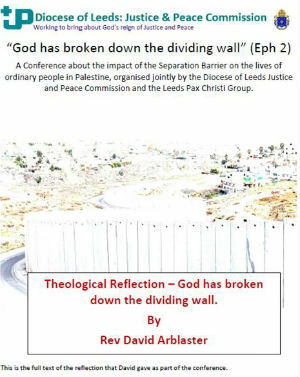 In 2013 Leeds Justice & Peace Commission, along with other northern dioceses and in partnership with Palestine Pilgrimages, organised a visit to Israel Palestine. This very moving video gives an insight into life in the village of Bil’in on the West Bank. It is about a Palestinian journalist and his friends and family as they try to live out their lives whilst engaging in nonviolent direct action against the confiscation of their lands. We have a copy at the Justice & Peace office. If you would like to borrow it then just send an email saying when you want to do this and someone will get in touch to arrange it. Started by Palestinian Christians, Sabeel promotes non-violence and reconciliation. You know that the UK has been involved historically in the Holy Land (Lawrence of Arabia etc-ignoring the crusades for the moment) but…it all sounds a bit complicated. It is! However, if you do not need to be an expert then take a look at the video on the Balfour project website. In 18 minutes it digests down the history of the region – making clear the role that the British played and making clear why the UK has a particular responsibility today to try to gain fairer treatment for Palestinians. This video, from Jewish Voice for Peace, is less than 7 minutes long – so it simplifies. Having said that, it’s a great introduction to understanding what is going on in the Holy Land today.